So let's talk stuffed mushrooms. One of my favorite recipes for them is this one from Ina Garten. The stuffing is a combination of sweet Italian sausage, scallions, garlic, cream cheese, romano cheese and parmesan. Breadcrumbs and chopped Italian parsley help bind everything together. When I last made stuffed mushrooms the other week, I had more than enough stuffing left so I froze it. Since it's a great stuffing mixture, I needed to get mushrooms into the picture. That's when I decided to caramelize some sliced mushrooms I had. Pasta is always a good backdrop for dishes and being that the stuffed mushrooms had Italian sausage involved, it made sense to combine the pasta, stuffing and caramelized mushrooms, right? So I have this pasta mixture sitting there in a casserole dish and the only thing missing is a sauce to tie it all together. With alfredo being one of my favorite sauces, I decided to roast some garlic and make a roasted alfredo sauce to toss the pasta in. And before I knew it, this dish was done.... and devoured. First prepare roasted garlic alfredo sauce: Preheat oven to 350 degrees. Slice top off garlic head, drizzle with oil and wrap in foil. Bake in preheated oven for 30-45 minutes. Cool and squeeze garlic paste from cloves. Heat cream in a skillet or saucepan. Whisk in parmesan cheese and 2 tablespoons of the roasted garlic, until thick and smooth. Reduce heat, add salt and pepper to taste; set aside. Next prepare stuffed mushroom filling: Heat the 2 tablespoons olive oil in a medium skillet over medium heat. Add the sausage, crumbling it with the back of a wooden spoon. Cook the sausage for 8 to 10 minutes, stirring frequently, until it's completely browned. Stir in the scallions and garlic and cook for another 2 to 3 minutes, stirring occasionally. Add the breadcrumbs, stirring to combine evenly with all the other ingredients. Transfer the sausage mixture into a large bowl. Add the softened cream cheese, romano cheese, parmesan cheese, parsley and Italian seasoning. Add salt & pepper to taste. Mix together to fully combine; set aside. In a skillet, add the remaining 1 tablespoon oil and sauté the sliced mushrooms until caramelized and browned. Add the mushrooms to the sausage mixture; set aside. 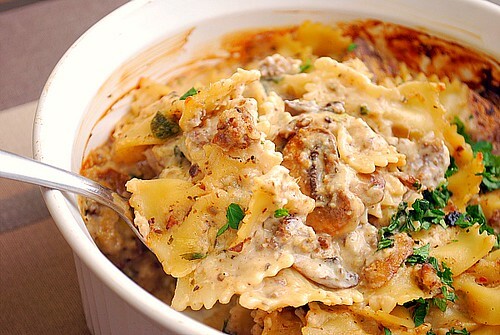 Add cooked pasta to the sausage mixture along with some alfredo sauce. Toss everything to coat, using as much alfredo sauce to your preference. 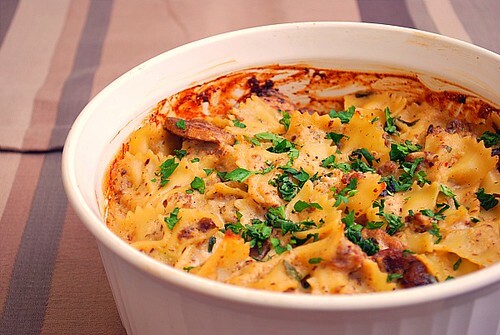 Transfer the pasta to a baking dish and bake in a 350 degree oven for 15-20 minutes to warm through. Serve hot and garnish with chopped parsley. Wow, does this ever look good. Will go on the to cook list. Thanks! omg I can't wait to try this! Its Lent so I'm always on the look out for something different on Friday nights - this is perfect if I omit the sausage!